GERARD PIETER ADOLFS | Geringer Art, Ltd.
GERARD PIETER ADOLFS (Dutch, 1898-1968). GERHARD PIETER ADOLFS (alternate spelling). Gerard Adolfs was born in Semarang, a city on the north coast of Java, Indonesia. His father, Gerardus Cornelius Adolfs was an amateur painter, photographer and musician. Adolfs studied architecture in Holland and designed several houses before returning to Indonesia in 1922. In 1924 he held his first exhibition, which included etchings and drawings of Javanese scenes. He then traveled to Florence, Rome, Vienna and Prague. In Paris he befriended the artist Foujita, and continued to exhibit in Java, Japan, Singapore and even San Francisco. 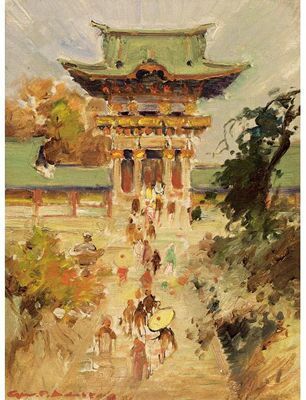 Adolfs specialized in scenes of life based on his travels in Java, Bali and Japan, and often painted market scenes as well as townscapes and landscapes. His best works feature confident, quick brushwork and elegant palette-knife technique. Adolfs returned to Holland in 1940, just before the occupation of the Netherlands by Germany. A number of his paintings were lost when the ship “Simaloer” was torpedoed. More paintings were destroyed in the bombing of Nijmegen in 1944. Despite these losses, Adolfs continued working and also wrote a book about Soerabaja, the capital of East Java. During his later years Adolfs lived mainly in Amsterdam, but also in Scandinavia, France, Spain, Italy and North Africa. Gerard Adolfs died in the village of s’Hertogenbosch, Holland, In February of 1968.